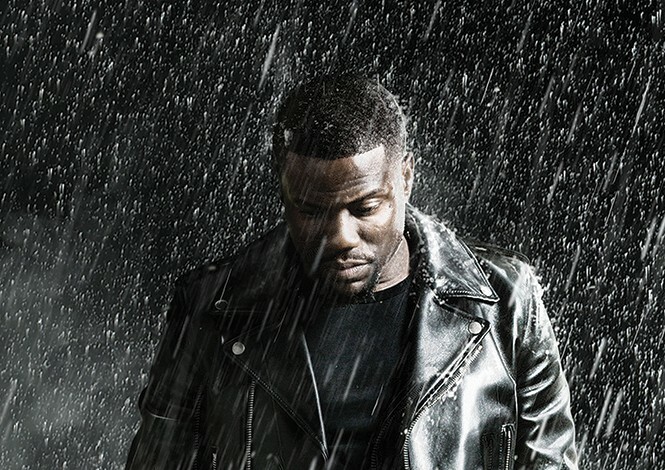 Kevin Hart should've gotten a solo cover on Entertainment Weekly a long time ago. Hart, a 35-year-old Philadelphia native, is one of the most popular, successful comedy superstars out there. His list of accomplishments in 2015 alone is impressive: He starred in two of 2015's most money-making comedies, The Wedding Ringer and Get Hard. He hosted Saturday Night Live for the second time. He presented at the Oscars. He emceed the Comedy Central Roast of Justin Bieber. And he was in Time's annual 100 Most Influential People issue, with Chris Rock contributing an accompanying essay. Now he's selling out arenas on his What Now? Tour, which makes a stop in Salt Lake City at the Maverik Center Sept. 8. And yet there is a sense that Hart doesn't receive the same acclaim, esteem or media attention as comedians like Louis C.K. and Amy Schumer, both of whom have been featured in Entertainment Weekly cover stories. They are revered as brilliant comic minds, whereas Hart is dismissed as the funny short guy you see all over the place. In a recent Daily Beast piece, "Who Thinks Kevin Hart Is Funny?" writer Stereo Williams pondered why Hart doesn't get enough respect. "Hart's success shouldn't be slighted," Williams wrote. "He's worked hard to get where he is. But it doesn't feel like he's where a comedian of his stature should be." One is almost compelled to yell the dreaded R-word about this. After all, Hart also has a TV show, Real Husbands of Hollywood, which actually pulls in big ratings whenever a new season airs. But since it's on BET—Black Entertainment Television, for those who don't know—people other than black folks might assume it's geared toward only black audiences (it's not, by the way); that it's not as white-people-friendly or buzz-worthy as, say, Louie or Inside Amy Schumer. Raleigh, N.C.-based comedian Thomas Dixson isn't ready to pull the race card just yet. He feels Hart is a comedian for all audiences, and his positive, populist swagger may turn off tastemakers who like their comedians progressive, thought-provoking and a little pissed-off (which would certainly explain why biracial comedy duo Key & Peele gets so much mainstream love). "I think Kevin Hart is kind of like Drake, and Louis C.K. is like Kendrick Lamar," says Dixson. "Hart is way more popular, but Louis C.K. does the kind of work that warrants the kind of attention he gets." It's not as though Hart is seeking that sort of attention, anyway. After all, he originally built his own brand and fan base through social media, extensive stand-up touring and YouTube videos. So he is very aware that if you go straight to the people and give them what they want, you don't need to wait for the media or the industry to call you the Next Big Thing. Saul Austerlitz, journalist and author of Another Fine Mess: A History of American Film Comedy, thinks this may explain why the media won't hop on the Hart train. "I think that, particularly for African-American performers, there does seem to be this track of creating your own brand and finding your own audience, and achieving incredible success without the awareness or the assistance of the mainstream media," he says, citing Tyler Perry and Katt Williams as other examples of self-made black stars. "And I think that what happens, in part, is that the people in the media feel like, 'Oh, someone like Tyler Perry or Kevin Hart has become really famous without my being aware of it.' And therefore, that success is somehow less significant, because it didn't involve media attention." Hart continues to work hard for the laughs. Next year, he'll star in Central Intelligence, a buddy-action-comedy with Dwayne "The Rock" Johnson, and Ride Along 2, with Ice Cube. He'll also voice a character in the animated feature The Secret Life of Pets—alongside media darling Louis C.K. So even if the purveyors of hype are still sore that they weren't involved in launching Hart's success, he'll be letting them know he's not going away anytime soon. This feature originally appeared in Indy Week.